Finding the right play kitchen can take hours of browsing through options. This guide cuts through that so you can spend more time with your kids and less time staring at a screen. After days of research and tons of product comparisons I’d say the KidKraft Ultimate Corner Play Kitchen is the best kid’s kitchen set out there. It’s a little pricier than others but it’ll keep your kids busy for hours on end. Although there’s a lot of variety out there and this guide has something for every budget. Whether you’re shopping as a loving parent, a grandparent, or as a cool uncle, this guide will help you decide on a great play kitchen set. Before buying a play kitchen it’s good to know what you want and how much you can spend. Some playsets are dirt cheap while others can climb up over $200. There aren’t many limitations to features but there are tons of makes & styles. 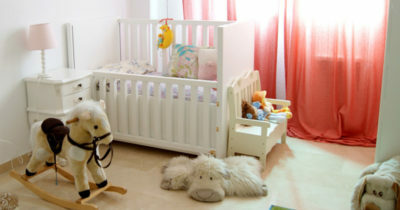 If you’re buying for an apartment or a small play room then size will be a huge factor. Likewise if you’re on a tight budget then you probably want a cheaper model, but not a cheap “gonna break any day” piece of junk. I’d argue the biggest factors are size, material, and price. If you don’t have enough room or money then you’ll need to limit your options right away. But materials are also important because wood is typically heavier than plastic or pressboard. And you might want a kitchen that comes with play utensils rather than buying those separately. I suggest organizing a list of needs/wants first so you know exactly what you’re shopping for. 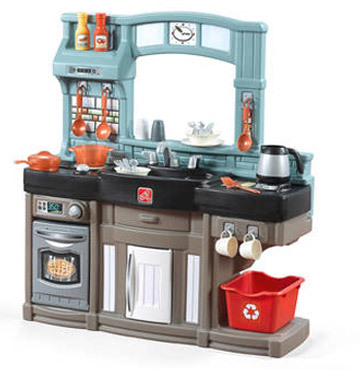 This way it’s easier to seek out the toy kitchen sets that best fit your goals. Before diving into the list I wanna state these kitchen sets were chosen for a diversity of features, designs, sizes, and prices. 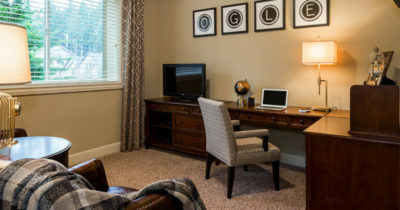 This research was completed by the Full Home Living team along with my own thoughts. If you have suggestions for play kitchens not listed feel free to send us a message and share why. I’m always willing to amend this list for good reason, but my goal here is to provide a large variety of the best play kitchens by outlining why they’re great. And with this much variety I’m willing to bet there’s something here you’ll like. Through hours of online research I found that KidKraft makes some really awesome toys. 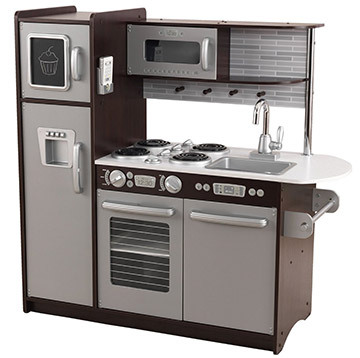 They have a few play kitchen models each with their own unique twists, by my top pick is the Ultimate Corner Play Kitchen. It feels just like a real kitchen because it has battery-operated lights and sounds. The stove burners make noise, the fridge ice dispenser makes noise, every knob turns & clicks with a surprising amount of realism. All of the appliances are “usable” in that your kids can open ‘em up and toss in food. The oven, microwave,and stove are the big three. There’s also a play washing machine built into the design which may feel strange to Americans. But many UK kitchens actually have washer/dryer hookups in the kitchen so it’s quite common overseas. Now because this is made of wood it’s a bit on the heavier side. It’s surprisingly easy to assemble but certainly not a quick job(at least 2-3 hours). This ships with so many pieces that the assembly can feel impossible. Thankfully the directions are crystal clear so if you follow them one step at a time you’ll have this up & running smoothly. If you want a playset that feels real and gives off a modern kitchen vibe then the Ultimate Corner Play Kitchen is the way to go. Here’s another design from KidKraft with a smaller build. This one also feels super realistic but it’s made for smaller spaces without the kitty-corner shape. The Uptown Espresso Kitchen has many similar fake appliances with a microwave, oven, and fridge. This one does not require batteries although you can add some if you want those extra sounds(two AAs). All play kitchens can work without the battery-operated features but this one’s especially versatile. It measures about 3.5 feet wide so it’s a reasonable size for sure. But if you have the space against a wall this won’t take up much floor space. The assembly for this thing is not pretty. It’ll take a long time to get this up & working because it ships with hundreds of different pieces. The instructions are easy enough to follow but will take at least 2-4 hours(if not more). Also for some reason the chalkboard on the fridge isn’t a real chalkboard. Kinda weird, especially for a kids toy, but it’s forgivable. 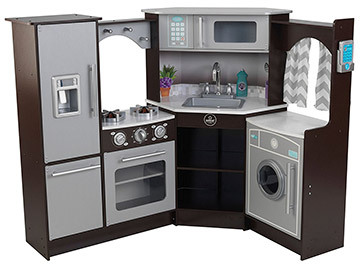 This kitchen makes a great choice for a mid-range playset that still features electronic elements without taking up as much space. This is the last KidKraft I found that really grabbed my attention. 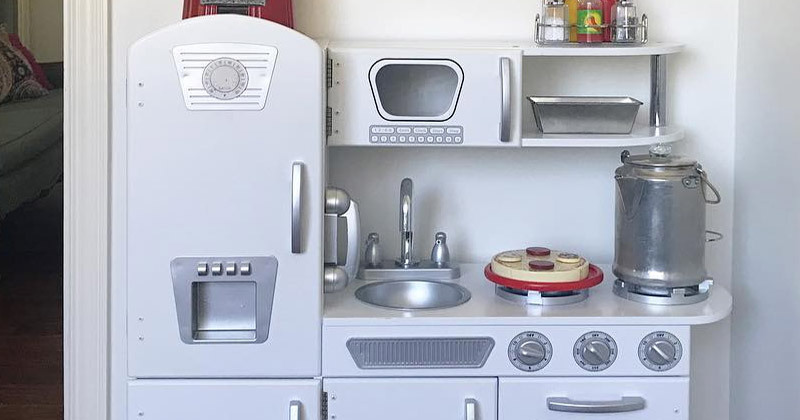 The KidKraft Vintage Kitchen resembles a classic 1950’s era kitchen but it still has all the amenities you’d expect. 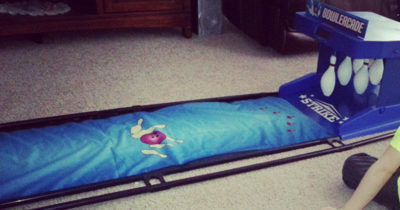 You can try matching the color to your kid’s room or whatever space you’ll keep this in. The kitchen comes with a fridge/oven/microwave along with a cordless phone(no batteries). 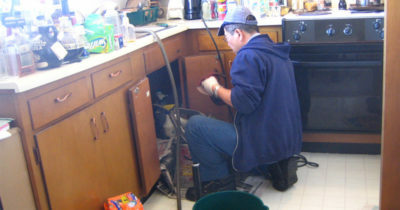 The sink is also removable which makes it easier to clean. This goes double if your kids love to use real food in their play kitchen. Just like the other KidKraft units, this one is built of wood/MDF/particle board or something similar. It’s finely designed and it feels just as high-quality as any other wood furniture in your home. Plenty of storage space in this thing along with some cool features that mimic the real world. For example the microwave plate rorates and you can remove the baking tray in the oven. However much like the other KidKraft kitchen sets this one has a long assembly process. You’ll need to attach every piece yourself. Every screw, every bolt, it’s a completely manual process. Granted it’s no worse than the other kitchens but it’ll take at least 2-3 hours. 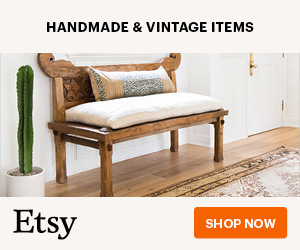 I mostly recommend this for parents who like the vintage look or wanna match one of the color schemes to a room. It’s a reasonable size and price for what you get but it does not come with any accessories so that’ll add to the shopping list. 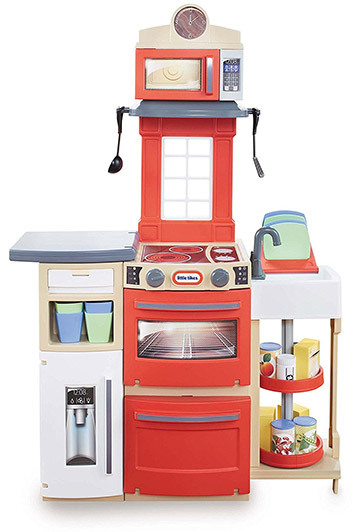 If you’re looking for a plastic play kitchen with all the fixins Little Tikes Ultimate Cook Kitchen is sure to please. This comes with a pack of 30 utensils like pots, pans, spoons and some play food too. The kitchen does pack in all the typical cooking appliances like a microwave and stove, but there’s no fullsize fridge in this model. However it does come with a neat under-the-counter fridge and even a cappuccino maker on the top shelf. All the play utensils are a nice touch but there is one issue: they don’t fit nicely on the pegs. Many product pics show these items hanging up near the top shelves but most of the holes don’t actually fit with these handles. You can chip away to make them larger but it feels kinda shoddy to do that. Still the kitchen is usable and it even has electric clicks/sounds if you add two AA batteries(not included). This seems like a staple in modern play kitchens. The biggest downside here is the wobbly back and top-heavy nature of the kitchen. It’s made of light plastic which is pretty safe, but this also makes it lighter than others. So it can wobble a lot if you keep it on carpet or if there’s a lot of stuff on it. Just this fact alone may push people away from buying it. But the lightweight design makes it easy to move and if you keep it up against a wall this should be fine. A few small concessions with this play set but if you’re OK with them you can get this at a great price with play food & utensils as an added bonus. Here’s another plastic design that I think offers a little more stability. The Step2 Best Chef’s Kitchen Set is pretty small and surprisingly easy to use. All of the “heavier” items stay towards the bottom like smaller shelves and the oven. 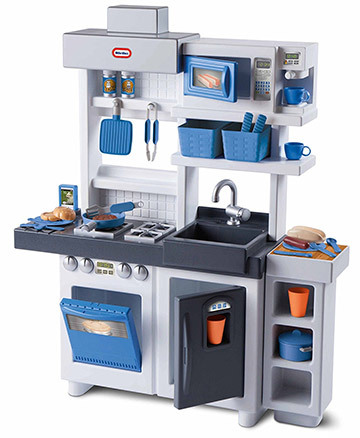 There is no microwave or fridge with this model so it’s mostly just a cooking/baking play set. One design feature I love is the small pass-through window with a little ledge for storage. 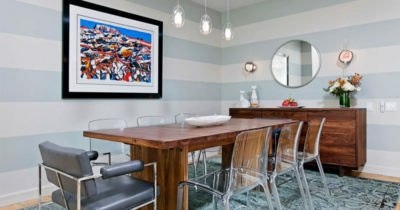 It livens up the design and makes it feel like part of the room. Also with this kitchen you’ll get 25 free utensils including pots, silverware, condiments, and some play foods. The coffee pot is especially neat since the hot plate actually lights up and plays sounds with AA batteries. The plastic material means you can bring this outside and use it even on overcast days. This really is the full package with everything your children need for a fun time. My biggest gripe is the quality of plastic. Again it just feels very thin and can be wobbly on certain surfaces like carpet. Since most play items remain on the lower half of the kitchen it doesn’t feel top-heavy which is a good thing. Assembly is no trouble and certainly not as time consuming as other kitchens(this should take max 1-2 hours). Just make sure to check the dimensions carefully and measure beforehand. The total kitchen is about 3 feet off the ground but the countertops are only 1.5-2 feet off the ground. This kitchen seems like a better fit for young toddlers or growing babies just learning to walk. 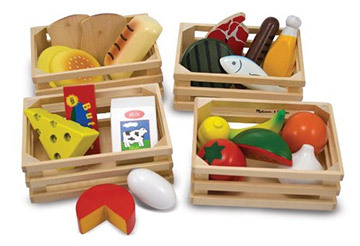 The Melissa & Doug brand is well known for their play sets and play foods. 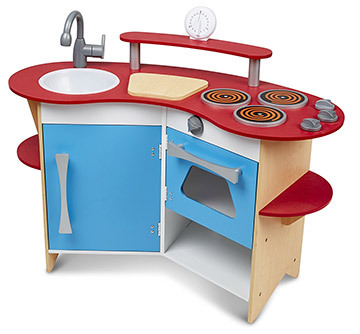 After researching many different products I have to say the Melissa & Doug Cook’s Corner Set is the best of the bunch. Note this is extremely simple and does not have any of the battery-operated features like other kitchens. This one is designed more for stability and ease of use. 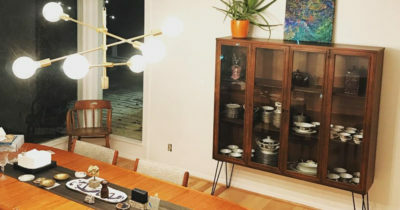 It’s built with a strong plywood or particle board design that feels light enough to move, yet heavy enough that there’s no worry of this thing toppling over. Assembly shouldn’t take long but there can be issues getting the boards & screws to go in right. This is more common with wood-based playsets rather than plastic so it kinda comes with the territory. Some of the product photos showcase different utensils & foods but this does not ship with any accessories. And because it’s not battery powered you’ll really want to pick up some other food toys if you go with this playset. For a simple wooden unit this thing is great. 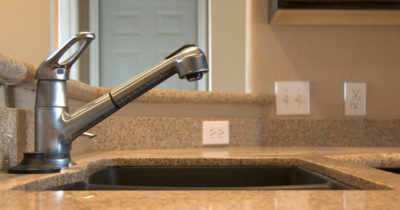 The sink is removable for easy clean-up and the kitchen timer even ticks down(only electronic thing in this set). It also measures similar to other kitchens with ~3 feet tall counters. Best age groups are probably 6 months up to 3-4 years old. For an even smaller toy check out the Hape Kitchen Play Set by USA Toyz. 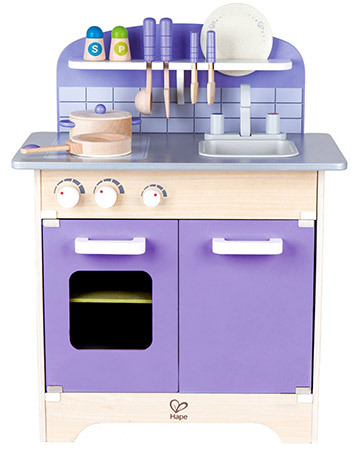 This one does come with accessories although they’re all wooden & colored purple to match the kitchen. 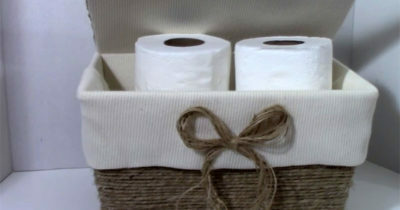 It’s designed with MDF wood and this is a great choice for the size. It’s not too heavy but definitely strong enough to withstand some forceful play. Won’t tip over or get very top-heavy because it’s only about 2.5 feet tall. In fact the height is one big reason I debated skipping this model. But since it ships with matching accessories it feels like a solid play kitchen for anyone on a budget. It’ll only last your kids a few years until they grow tall enough to overshadow the thing. But in that time they’ll have a blast. And this avoids all battery-operated features so it’s the perfect choice to avoid the “such-and-such not included” baloney. The accessories include a pot, silverware, plates, a spatula along with a few other cooking utensils. Also I realize the purple might polarize towards “girly” because it’s such a light color. This is definitely a unisex model but feels especially at home in a girl’s play room. Really this comes down to what you’re looking for and what your kids will enjoy. 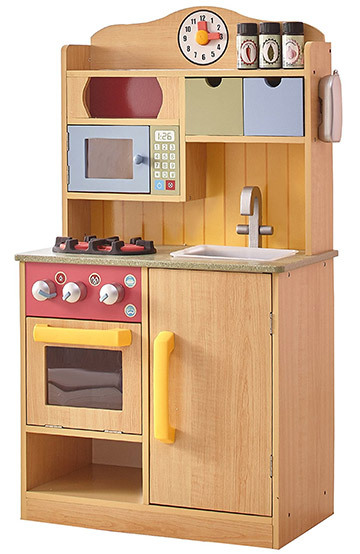 On the cheaper end of the spectrum is the Teamson Kids Burlywood Little Chef kitchen play set. But despite this price this doesn’t feel very cheap and it’s one of the main reasons I added this model into the post. 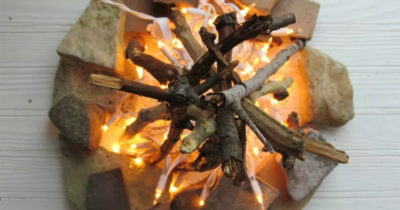 It’s made of a strong wood material and does not feel at risk of toppling at all. Plus it’s got a unisex color scheme that should match boys & girls, not to mention any color room in your house. I don’t love the cheap oven/microwave door material since it feels pretty thin. But overall the build quality is superb considering how much you get for the price. This kitchen ships with 5 accessories: a phone, 3 fake seasoning shakers and a cooking spatula. It’s certainly a start but probably not enough to get the creative juices going. Measuring over 3 feet tall this kitchen is bound to last a while. It’s certainly not the most detailed play kitchen but it’s definitely an affordable option if you like the wood design & and want something safe. A note on assembly: it really helps if you’ve assembled items before from places like IKEA. I can’t say this is really that bad or any worse than other wood play kitchens. But if you don’t have at least 1 hour to put this together it may turn into a frustrating experience. 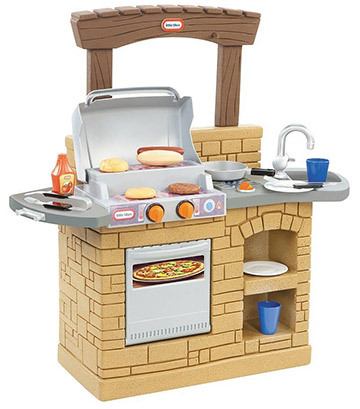 I have to mention this awesome outdoor BBQ playset created by Little Tikes. It comes at a much cheaper price than other kitchens because it’s smaller and simpler. This just comes with a grill area, an under-counter oven, and some counter space. The unit is all plastic so it’s pretty lightweight and it’ll stand up to rain or shine. The grill is pretty simple with decal stickers taking the place of the real grill bars. However this does come with a dual-level design just like a true-to-life gas grill. By default this playset does not come with any toys or accessories. But if you pay a little extra you get the Little Tikes BBQ-style accessories with grilling tools, corn on the cob, hot dogs, and squeeze condiment bottles. I do think the grill/counter area is a bit “small” considering the size of the playset(almost 3 feet wide). And the actual countertop only measures about 2 feet off the ground so it can feel too small for older kids. It really depends on your children and if they’d enjoy an outdoor grill set! If you’re working on a tight budget and want to get the cheapest play kitchen that’s still high quality then you’ll want the Little Tikes Cook ‘n Store Kitchen Playset. 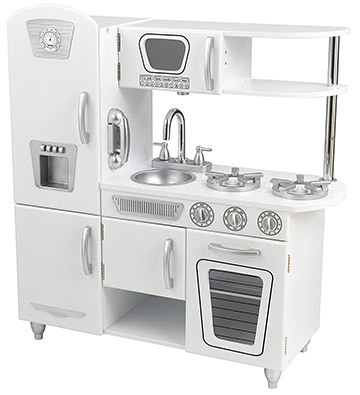 This is probably not the absolute cheapest play kitchen out there, but most of the others I checked were just garbage. It’s tough finding that sweet spot where you’re not spending too much but still getting a usable item. And with this Little Tikes playset you get the best of both worlds. It’s all plastic and built for play with usable oven & microwave doors. It’ll hold up outside and it doesn’t even require assembly! Not to mention this play kitchen comes with 32 bonus accessories like pantry cans & boxes, a spatula, and various plates/silverware. For the price you absolutely cannot beat how much stuff you get and the lack of assembly is a treat for parents. Just note this may look large in photos but it’s a pretty small playset. It only measures about a foot wide and a foot deep(against the wall). The height totals over three feet so it’s a tall unit but most of this comes from the top microwave shelf. Still with the two ovens & stovetop, the sink, the fridge(with water dispenser) and microwave this small playset packs a big punch. And it’s one of the few kitchen toy sets that won’t break the bank. What good is a play kitchen without plates, cooking pans and play food? Some toy kitchens ship with accessories included but few come with enough to keep your little ones entertained for hours. So I’ve curated the best play food sets and utensil sets you can buy for your kid’s play kitchen. I’ve organized a large variety of food types, cooking utensils, and varying item amounts so there’s a lot to choose from. 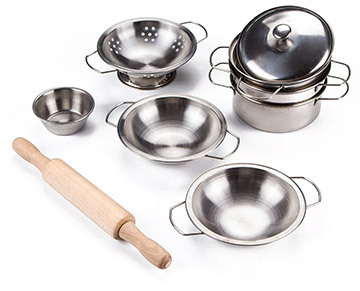 But all of these are super affordable and they make a great addition to any cooking playset. Looking for some play food with a little bit of everything? Then check out the Melissa & Doug Food Groups set. It comes with four pretend crates holding fake carbs, meats, fruits and veggies. Your kids will have a smorgasbord of foods to pick from and lots meals to chef up in their kitchen. The default pack comes with 21 items but you can add extra accessories for condiments/pantry items and even canned goods. Plus the Melissa & Doug brand is fantastic for their variety and quality. With this food pack you can get just enough to add some fun into the play kitchen without crowding your house full of fake plastic foods. If you’re trying to pick up all the best play foods with as much as possible then this set is for you. 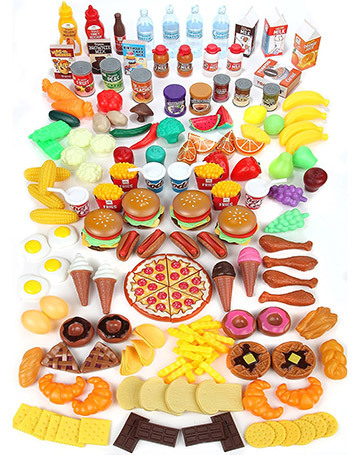 In the Mommy Please 202 food set you’ll get literally 200+ pieces of individual foods ranging from burgers to french fries, pizza slices, ice cream cones and so much more. Breakfast, lunch, dinner and dessert are all covered in this massive pack. It even includes some drinks for orange juice bottles and cartons of milk. Loose fruits & veggies work well as raw cooking materials and your kids can add some flavor with the ketchup & mustard bottles. One thing to note about this pack is that it’s primarily food only and does not have any utensils. But for a massive collection of plastic play foods this is probably the best deal you’ll find. As a follow-up to all the food sets you’ll probably want some utensils and cooking materials. Melissa & Doug come to the rescue with their 22-piece play utensil set full of pots, pans, silverware, plates, a skillet and even a baking sheet. This is pretty much the “standard” set of utensils you’d expect anyone to have in their kitchen. It has items you can cook with and items you can eat with so it’s really the full shebang. 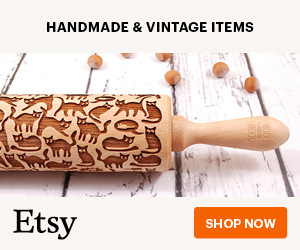 Other cool items include realistic salt/pepper shakers along with a fake olive oil bottle for frying. The oven mitt is another nice touch to get your kids comfortable protecting their hands before reaching into the oven. If you want play kitchen utensils that look a little more realistic Toyerbee’s play toys has you covered. These genuinely match up closely with stainless steel kitchen utensils and they look incredible. The pack comes with large boiling pots and smaller frying pans and even a colander. 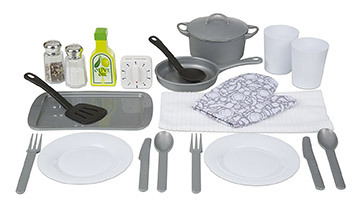 Various pots & pans line this toy pack along with a couple oven mitts and a rolling pin. Great for your adventurous little tyke to get accustomed to how real kitchen utensils look. Unfortunately this does not come with any plates or silverware so this is mostly a cooking-oriented toy pack. Wanna bring some breakfast into your kid’s play kitchen? 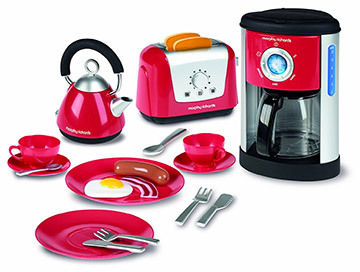 The Casdon Little Cook Kitchen Set is packed with everything you’d want for the most important meal of the day. It comes with a toaster, tea kettle, full coffee maker and even some play breakfast foods. This also includes a few plates and silverware to pretend-eat the bacon & eggs. Some of the food sets I mentioned above also have breakfast items so they pair well with this breakfast pack. And if you search around you can find lots of breakfast play sets with items like waffle irons and even sugar dispensers for that morning cup o’ joe. People want different things for their kid’s toys so there is no single best product. But the variety in this shopping guide offers plenty of play kitchens to get you started. If you can afford it I highly recommend the KidKraft Ultimate Corner Play Kitchen because it’s just so awesome. It feels like the play kitchen equivalent of a kid’s treehouse with all the realistic minor details your kids will love. But if you still aren’t sure what to get try organizing your “must-have” features in a list. This way you can select play kitchens with certain requirements and cut out the ones that don’t have what you need.